Pitch Conference 2018 was my very first, ever, conference for writers. Hosted by the Loft Literary Center in Minneapolis, it had nineteen literary agents attending as well as publicists, small press editors, published authors, and university faculty, and about 170 attendees. The Loft's next big conference will be Nov 1-3, 2019 and it will go by a new name, Wordsmith. For our working box lunch, literary agents Barbara Poelle and Jennifer Carlson gave us hints on how to pitch and answered many questions from the audience. An entertaining evenings session of The Fast and the Queryous was held with a panel of literary agents--Janet Reid (of Query Shark fame), Samantha Fingerhut, and Natanya Wheeler, and editors--Cal Morgan and Caroline Bleeke, letting the audience know when they would quit reading a query letter and why. On Friday afternoon and all day Saturday, we had breakout panel choices that each focused on four areas: craft, equity, career, and publishing. I shared some of the information about these three sessions with my facebook writer group, which is a safe space and we had a good discussion about some of the issues facing white writers who try to create diverse communities within our stories without negative stereotyping or creating more systemic harm for people of color. Speaking about diversity can lead to tension. At Pitchfest the character of Cho Chang from the Harry Potter books was brought up. I mentioned this to my writer group. Three resources were pointed out that speak to these issues: a poem by Rachel Rostad, a rebuttal about her interpretation, and her response to that rebuttal. At one of the sessions, a question was asked about the Sioux name for one of the Midwest Native American tribes. Sioux is a name that means little snakes and it was given by the French traders and the Ojibwe tribe to the Dakota tribe. One of the issues I've become aware of in my story, after the Friday night query panel and these sessions, is that I'm in danger of having a white hero trope. Not a good thing. Yet, if I went to the other extreme I would have a passive heroine and that's not good either. So I've had to go back to work on my manuscript and check out those particular layers. Concurrent with the breakout sessions, pitches were also happening. Before the Conference, we had received a form to fill out with our literary agent preferences. The Loft staff then assigned us to an agent and a time. When it was time for our pitch we were required to be in the area 10 minutes ahead of time as scheduling was tight, 8 minutes per group. I took my query letter in for one agent and for the others, I did my pitch. One agent did give me her card to be in touch if I sort out my white hero/passive protagonist issue! The best part, of course, was the networking with other authors, practicing our pitches on each other, sharing meals together, and exchanging emails to stay in touch. 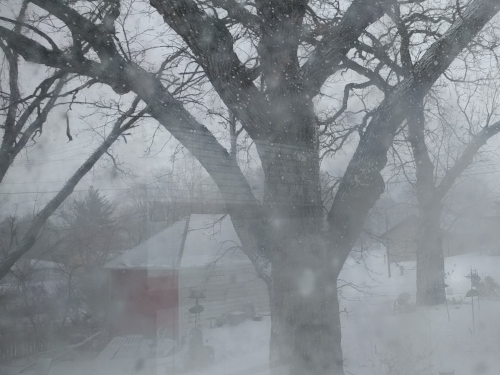 In contrast to last week's post about writing a story's Quiet Black Moments, this week I'm experiencing the wind and snow, sometimes snow pellets, in the Midwest's latest spring snowstorm. I am also in the midst of getting ready for my first writer's workshop. I have now received the names of the three literary agents I will be pitching my story to and what time I am expected to be there. Whoo-boy! I am excited. Of course, on the day of I will be on the extreme side of nervous. What workshop? The Loft Literary Center in Minneapolis as a Pitch Conference 2018. I have finished the fifth draft of my story. Now it needs some fine-combing. And I can focus more on the pitch itself and the query that I want to have along with me. My next post will be April 27.